Which one is the Best British Tv Series of 2018? There are a lot of popular Tv Series in UK Televisions. We decide to choose the best TV Series with country of origin United Kingdom. 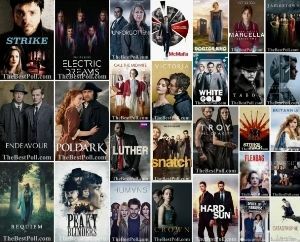 This list is composed of British Tv Series of 2018. Here are our picks for the best TV Series of 2018. Choose your favourite one and vote! The Last Kingdom vis the best show on Netflix! The cast is amazing, so talented, and David Dawson and Alexander Dreymon have done an outstanding performance! All the actors are superb! Make up and costumes are excellent! I can’t say enough about The Last Kingdom.. Eliza Butterworth, Millie Brady, Julia Bauch With, Ian Hart, Adrian Boucher, Mark Rowley……. Watch the three seasons and see the growth in each one! The Last Kingdom.Best show ever. Poldark. Wonder series. Love it!!! Wonderful story and great acting! Hands down the Last Kingdom! Beautiful writing,acting, dialogs, costumes, scenery. Everything was excellent this 3rd season, especially the relationship between Alfred and Uthred was presented in a very moving way end with an end scene between the two that was worth for an Oscar. The Last Kingdom is by far the best. Awesome story (based on actual history), actors who bring depth and complexity to their parts, strong female roles,lots of action, gorgeous horses if you’re a horse fan, great costumes and makeup- in short, everything you could want in a television show. Absolutely the best series that is on TV. The acting, because the choice of actors has been brilliant. Everything about this series is wonderful. It is based on Bernard Cornwell’s books which should say a lot if you are a reader. Screen writing is perfect and what makes it so interesting is that much of the story is true. TLK has great story lines great actors and a devoted production team and a huge following. All based on true British history. What happened to “Bodyguard “? Bodyguard is added. Thanks for your comment. The Last Kingdom has been made into a fantastic TV series adapted from the books written y Bernard Cornwall. It’s set in the time of King Alfred and tells Uhtred’ s journey to reclaim his home Series 3 starts on Monday 19th November 2018. The Last Kingdom is trending on Netflix now because it is just that good! Last Kingdom – just brilliant! Can you please add The Last Kingdom to the list for best TV series 2018. It is a truly superb programe detailing how we became united as one as the Kingdom we are today! There is amazing actor’s on this show some whom have ecxeptional talent. Not to mention the Director’s and crew. My favorite – acting incredible – it grabbed me from the very 1st episode!!! The Last Kingdom is amazing!!! The Last Kingdom! Stunning actors, sets and scenery and the story is our history. Thank you so much for adding The Last Kingdom to the poll. The cast and crew work so hard to bring quality entertainment to fans. They truly value those who support them. I have never seen this level of loyalty from actors, past or present. The Last Kingdom is added. Thanks for your comment. Poldark esta série e maravilhosa! Couldn’t agree more. This program has everything, great cast and fantastic script. Oh and gorgeous leading man! Deep State is added. Thanks for your comment.